OEM & Industrial Fans | Air handling specialists. We serve many types of customers, including OEMs (Original Equipment Manufacturers), CEMs (Custom Equipment Manufacturers) and Industrial End Users. Whether the project is determining the best fan for a piece of equipment designed for repeat production (OEM), for a customer who needs a different fan on a per project basis (CEM) or and end user who needs a fan for his process or facility, we consider many factors in selecting the most suitable product: including performance, efficiency, cost, noise, space constraints, materials of construction, airstream characteristics, motor requirements, temperature, etc. Generally, these fall into two categories: Centrifugal Fans/Blowers and Axial Fans. Centrifugal fans and blowers consist of a wheel (impeller) usually housed in a scroll-type housing. The air enters the housing inlet, is turned 90 degrees, and is blown out the housing outlet. Depending on the application, there are a number of wheel types available. Axial fans consist of a propeller generally mounted in a drum (looks like a piece of round duct) or a flat panel. OEM fans are specifically engineered and efficiently manufactured to meet the specific needs of individual OEM requirements. Watson Power represents the Cincinnati Fan and Ventilator Company, Inc. across the Northern Ohio region providing sales of new fans/blowers and a full range of Cincinnati Fan replacement parts. 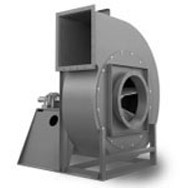 The Cincinnati Fan product range includes: centrifugal blowers, centrifugal fans, axial fans, axial blowers, custom fans and blowers, dust collectors, portable fume exhausters and portable blowers. Daniels Fans manufactures industrial duty high temp fans for operating temperatures up to 2200°F. Watson Power represents Northern Blower across the Northern Ohio region specializing in pressure blowers, high pressure blowers, backward inclined, radial blade centrifugal fans and more. Representing VAW Systems with expertise in silencers for fans. Representing BAM Fan Accessories, Inc. across the U.S., specializing in fan connectors and fan accessories for industrial applications.